The uses of multimedia are rapidly increasing. Its power to present information in ways not previously possible and its integration of resources, allow for the creation of rich learning environments. 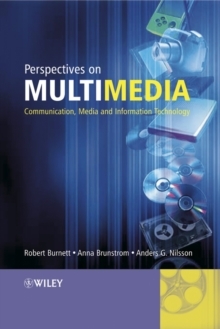 "Perspectives on Multimedia: Communication, Media and Information Technology" provides a critical examination of the latest multimedia developments and approaches, such as Interface Technology and QoS architectures. The topics covered include: the key concepts intrinsic to digital forms of multimedia: integration, interactivity, hypermedia, immersion, narrativity and hybridity; the development of Information Technology (IT) usage in society and in the business community; how modern IT enables private companies and public organisations to support business operations, create new business opportunities, and to promote more proactive service management; multimedia from a computer science perspective and how computer science provides the technical foundation for the computer software and hardware that drives the information age; and gives a broad range of perspectives on key issues for interactive multimedia in organisations and industry today. This book will be of interest to practitioners involved in multimedia development in an organisation, management consultants giving professional advice on digital solutions and information technology matters to their customer organisations and academics focusing on business and technical aspects of multimedia frameworks.